In the conclusion of his highly anticipated follow-up, Us, Peele seems to dismiss ambiguity. 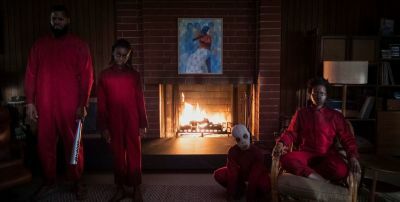 Even if his horror-fantasy device – flesh-and-blood alter-egos of a family haunting them – is a stretch, it’s welcoming to the thoughtful horror crowd. And yet, in a clever move by the writer-director-producer, there is ambiguity in the ending. If you take it at face value, the film presents heroism rising from a lowly state, a kind of evolution of the underdog. Though if you consider the finale’s alternate reading (which you’ll see, if you think twice), Peele comments on humanity’s capacity for the monstrous. This reading makes the film not the rather conservative piece that so many are already buzzing about, but a more progressive work. It indicts conservative ideology and the traditional family unit as repressive to women, especially the mother in question, Lupita Nyong’o’s Adelaide Wilson. Shes defies patriarchy in asserting her power, by fighting for her family. But in doing so, she develops a loathsome self-image, thinking the worst of what she has become. Thus, in following Get Out, Peele continues to grow as a genre revisionist. He’s not just playing games for web-searching film geeks, like Tarantino does, but creating a probing discourse in genre study – how we can use genres to address our fears as society moves to new, actual ones. Us is situated as a home-invasion film – essentially Get Out (in which an innocent descends into a form of hell) in reverse (the hellish now invading the home). Hence, Peele invokes The Purge, The Strangers, and even lesser films like Cage-Kidman misfire Trespass to show how terrifying the motif can be – and he is acute at getting to our nerves. The filmmaker does it without heading toward self-aware Funny Games art house territory, in handling the film as a genre entertainment. Peele takes what is mainly a crime film subgenre (a descendant of gangster-invasion films, like The Petrified Forest and Key Largo) and hybridizes it with horror by invoking the psychological sources of the genre: Freud’s The Uncanny and The Return of the Repressed. In Us, monstrous versions of the family members invade the family – interestingly, in their vacation home, where they have been absent and thus, are vulnerable. Naturally, the invaders are the family’s immediate “others” – what they deny in themselves now materialized. In what appears to be a supernatural take on the home-invasion film (the criminal raiders now ghosts), Peele eventually reveals the terror to be greater, pointing to another subgenre of the horror film (without spoiling too much, think scholar Vivian Sobchack). Nyong’o seems invigorated at the chance to play dual roles (as the rest of the family member cast does). As the mother, she plays a victim who channels cunning and strength. In the other role, the actor tests her abilities of channeling the human monstrous (if her voice gets some hushed giggles in the theater, it will have more trying to shake it days later). The roles of father and son have an easier time, while Shahadi Wright Joseph, as a track athlete/daughter Zora, has fun mastering both terrified and terrifying personas (the young performer was a find for the production). While commenting on gender, Peele fits in some capitalist critique (if scattered) when depicting the realm of these “evil halves” that are invading normality: they mock the consumptive and decadent actions of their counterparts. More compelling is Peele’s commentary on the constant fear that blacks have for their safety, even those, like the Wilsons, that are firmly middle class. It’s all the more dire when seeing their white “friends” can achieve even more affluence while being complete dolts (yes, their safety is of little concern to the viewer). The finale – though complex, as I addressed earlier – feels like a desperate move for the artist of Get Out. Thankfully, the discerning viewers can see something greater. Regardless, the film is an economic nightmare machine, once it gets going. Serving both worlds of fans, the terrors are eerie and bone-crunching, after a slow start going for mood. Peele crafts suspense and measured helpings of gore, in the same brisk rhythm as Get Out. Mostly he keeps it balanced, along with the humor – yes, as a hybrid genre piece, it’s his second horror-comedy. And as one can imagine, Peele likes playing “Hitchcock Games” – while explaining some early references (a major cultural event of the 1980s), again he likes it if you know your horror film history. Matthew Sorrento is Co-Editor of Film International and teaches film studies at Rutgers University in Camden, New Jersey. He has forthcoming book chapters on The Purge series and Bogdanovich’s Targets, the latter to appear in his collection, David Fincher’s Zodiac: Cinema of Investigation and (Mis)interpretation, co-edited with David Ryan, forthcoming from Fairleigh Dickinson University Press.